Toronto – November 27, 2018 – The Canadian Council for Aboriginal Business (CCAB) is pleased to announce the 2019 Aboriginal Business Hall of Fame (ABHF) recipients of this year’s prestigious national awards. Ms. LaRose’s rich history of accomplishment in the field of recruitment and executive search has given Indigenous perspectives a powerful voice in organizations across Canada. She is the founder of Higgins Executive Search, a firm specializing in recruiting Indigenous professionals for board-level positions, leadership succession and executive recruitment. Brenda started up the boutique executive search firm in 1999 and, since then, she has worked tirelessly to establish her company as Canada’s leader in placing senior Indigenous executives and board members. The firm is internationally recognized for its expertise in recruiting Indigenous professionals. ?In the spring of 2017,? Higgins Executive Search merged with Leaders International Executive Search, a national firm in Montreal and part of an international network of 47 offices globally. Tundra North Tours President Kylik Kisoun Taylor, the recipient of the 2019 CCAB National Aboriginal Youth Entrepreneur Award, established his tourist company in 2006 with the dream of sharing Inuit culture and love of the Arctic with the world. Based on his vision of providing visitors with truly authentic arctic experiences that allow them to immerse in the land, cultures and history of the North, Kylik Kisoun has built a truly unique and highly successful tourist enterprise. In summer, Tundra North offers tours to traditional Whaling and Tipi Camps where guest experience Inuialuit and Gwich’in culture and values. In winter, the firm offers the only Indigenous Signature Experience in Northern Canada where guests from around the world get to build and sleep in their own igloo, drive an ice road, herd Reindeer and drive to the Arctic Ocean. Kisoun Taylor founded his firm with the goal of giving guests a transformative experience that would shape their understanding of Inuit beliefs, morals and traditions and the sustainability and beauty they create. In so doing, he has built bridges of respect and created a valuable source of tradition-based employment. 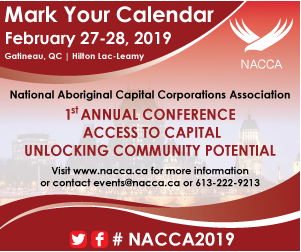 The Aboriginal Lifetime Achievement Award is part of CCAB’s Aboriginal Business Hall of Fame, which recognizes Aboriginal persons whose business leadership has made a substantive contribution to the economic and social well-being of Aboriginal people over a lifetime. The inaugural award was given in 2005 and there have been over 23 laureates since then. The National Aboriginal Youth Entrepreneur Award is presented annually to an Indigenous entrepreneur under the age of 35 and includes a $10,000 financial prize.